A MOTHER-OF-FIVE has been made redundant and told to get out of her company house only weeks after saving the life of one of her bosses. 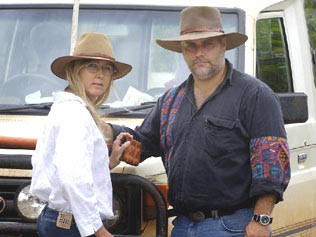 Sharon and David Hegyi have been sacked after seven years at Tipperary Station in the Northern Territory - just weeks after Sharon saved the life of one of her bosses, the Northern Territory News reports. Office worker Sharon Hegyi, 39, is devastated by the decision. She and her mechanic husband David had worked on Tipperary Station, 200km south of Darwin, for seven years and had planned to stay there until they retired. "We loved the lifestyle," Ms Hegyi said. "We loved bringing up our kids there. "We don't drink or smoke. We just worked hard and went home to our family." A letter from Tipperary's human resources boss, Elise Dunlea, says the couple were laid off because of "down-sizing". "I could understand it if we'd done something wrong," Ms Hegyi said. "But we didn't." Station finance manager David Breed had a severe heart attack at work in September. Ms Hegyi, who is a registered nurse, rushed to help. She gave him medication, hooked him up to oxygen and called an ambulance from Adelaide River. "But he deteriorated rapidly and I thought he was going to die," Ms Hegyi said. "So we put him in a car and David drove towards Adelaide River. "The ambulance met us half way." Mr Breed was taken to Royal Darwin Hospital and was off work for several weeks. "I honestly believe that I saved his life," Ms Hegyi said. The couple were shocked when they returned from holiday after Christmas and were told they were being made redundant. They were given a separation package and told to leave their company house within two weeks. "We're shattered," Mr Hegyi said. "We've got no jobs, no house and five kids. "I know we'll be able to get work easy enough but we just want our old jobs back." Tipperary general manager David Warriner confirmed that Ms Hegyi saved the life of one ofhis managers. He said the couple had been laid off for economic reasons. "It's a redundancy," he said. "It's unfortunate and difficult for everyone."